Canadian astronaut David Saint-Jacques says the biggest part of his preparation as he gets ready to leave Dec. 20 for a visit to the International Space Station is making sure his family is ready to deal with his six-month absence. "Two years out is too far to think about that, but a couple of months out you are starting to think: 'I'm actually leaving for a long time in a very faraway place'," he said Thursday during a news conference at the Johnson Space Center in Houston. "I better make sure that everything is in order in my life before I do that and my family is OK."
Saint-Jacques, 48 (he'll turn 49 on the space station Jan. 6), is married to a medical doctor and is the father of three children -- boys aged seven and five and a two-year-old girl. In a later interview with The Canadian Press, Saint-Jacques said he's impressed his children understand what's going on. "We've spent a lot of time explaining to them at a level that they can grasp the fact that the Earth is a planet in space, that things are on orbit around it (and) that there's this house in the sky where daddy is going to go," he said. Saint-Jacques added his children have also spoken to people when they were on the space station. "The other day I was driving past these big satellite dishes that we have on the Johnson Space Center and my five-year-old son pointed out that: 'Hey, that's how we speak to your friends up in the sky'," he said. With less than three months to go before he heads into space, Saint-Jacques has finished learning the technical aspects of his training. "We know how to do our tasks, operate the machinery, space suits, the robotic Canadarm2 (and) the Soyuz," he noted. 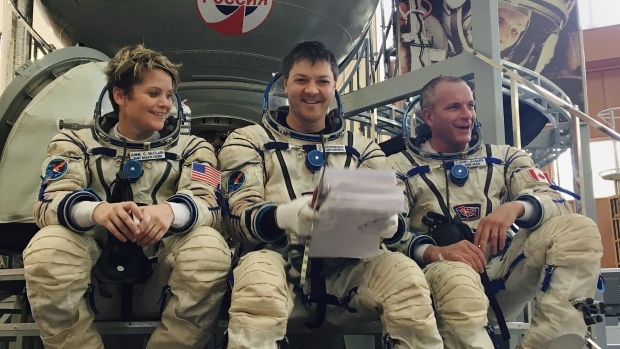 Saint-Jacques said he and his two space colleagues -- U.S. astronaut Anne McClain and Russian Oleg Kononenko -- are now entering the phase of learning about the science experiments they will be performing. "We're learning to become useful, if you want, to the scientists on the planet on Earth who have prepared all the experiments for us on board," he said, adding they themselves will also be the subject of several experiments. The three will blast off in a Soyuz spacecraft from the orbiting space laboratory in Kazakhstan. It will be the first space flight for both Saint-Jacques and McClain, while Kononenko will be making his fourth trip to the station. Saint-Jacques, the ninth Canadian to travel to space, will also serve as a co-pilot in the space capsule and, because of his medical training, will be the crew's doctor on board the space station during the six-month stay. Before joining the space program, he practised medicine in a remote Inuit community on Hudson Bay. The last Canadian to visit the orbiting space laboratory was Chris Hadfield, who completed his five-month stay in 2013.